The Clichy basket paperweight on the cover set the all time world's record for a paperweight -- $258,500. This fabulous catalog from the Sotheby's June 26, 1990 Sale of paperweights includes 85 paperweight lots, 2 lots of paperweight references, and 18 paperweight related lots. 36 Lots are illustrated in color, the remainder (except for books) are in black and white. In spite of the high price for the record breaker, it is surprising how many weights went for less than $1,000. 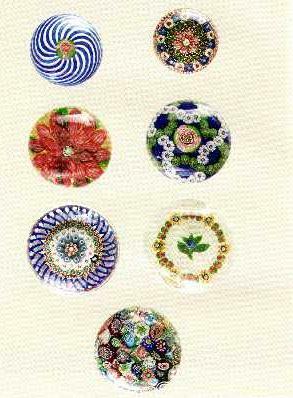 and American factories (Boston and Sandwich, New England Glass Company, Mount Washington, Union Glass, Millville). There are also some more modern weights by Ysart, Kaziun, Deacons, St. Louis, Baccarat, and Perthshire. 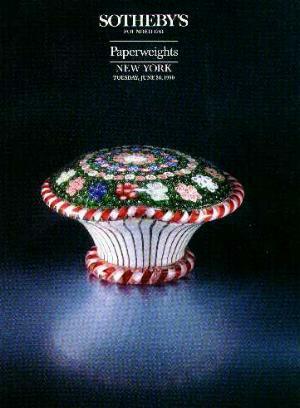 This is a "must-have" catalog for every paperweight collector. It includes the prices realized for each lot. 8 1/4" by 10 1/2". 52 pages. Soft bound. Click on the picture to see an example of one of the color plates.